White Mulberry cultivation has a long and rich history dating back thousands of years ago as a requirement for silkworm rearing. They were beloved by Persians, Romans and Greeks and moved throughout Europe along with the spread of culture from these places. 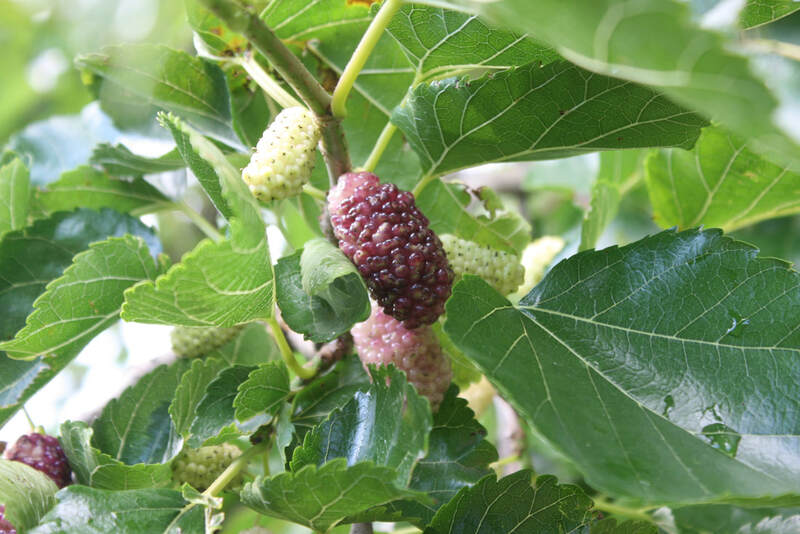 A fast-growing, small to medium-sized tree growing to 10 –20 m tall, Mulberry produces delicious fruit, useful fodder for animals and wood used in craftmaking. Mulberry are also excellent plants for use in polycultures. They are tolerant of partial shade so suitable in the edges of an under storey of a larger tree and are not very nutrient demanding or competitive. For more detailed information on this plant please see this blog post.To order this plant please contact us: balkanecologyproject@gmail.com. native habitat: Not known in a truly wild situation. Prefers a continental climate with its hotter summers. The flowers are monoecious (individual flowers are either male or female, but both sexes can be found on the same plant). The plant is self-fertile. It prefers moist soil but can tolerate drought. years to bearing yield: Cultivar whips should start to fruit in the 2nd or 3rd year. Fruit: Delicious fruits fresh or dried.White Mulberry fruits are generally very sweet and ripen over an extended period of time unlike many other fruits which seem to come all at once. The fruiting period can be from 6-8 weeks. Leaves: Make great food for livestock (cattle, goats, pigs and rabbits) and are used across the world especially so in areas with poor soils and low rainfall where fresh forage is not always available. Medicinal: The bark is said to be good in the treatment of stomach-ache and the leaves and twigs can be used for treating heavy colds, cough, red eye, insect bites and wounds. The fruit is used in the treatment of sore throat and melancholia. The Chinese have used Mulberry fruit for centuries for its aphrodisiac qualities. The trees can get large and will cast a heavy shade when mature so this should also be taken into consideration when planting.